I recently retired (from 30+ years as a precaster and 6 years in IT before that). Later in the year I expect to complete a rework of a presentation on Knowledge Management, focused on possible industry-wide approaches to gathering and managing all the currently highly dispersed knowledge that underpins commercial construction and on why such an approach is a necessary precursor to any serious automation that reflects and incorporates all the deep real-life knowledge of materials, products, and interface issues required to actually build something. To this day I find that most commentators or thinkers (invariably from the software or design side, not contractors) grossly misunderstand those complexities. The main thread running through my writing is: how can we assemble, organize, and access the immense body of knowledge that underlies a building. I specifically solicit your comment and disagreement on my assertion that virtually no one outside of the actual business of constructing (not designing) commercial buildings and structures grasps the actual complexity. In working on that 2015 presentation I solicited comment from a young construction manager I knew and I thought his response was terrific. I have reproduced it below. Sorry this took so long – I decided to take my time and really reflect on everything. As with the construction industry itself, the topic of knowledge management is very complex as it applies to construction and can be taken down many avenues. It has been difficult to really outline all that I want to tell you. My initial thoughts are very much centered around two points you delivered in a conversation we had at the Schiffers’ house a couple of years ago (both of which also appear in your presentation) – Every construction project is a prototype, and, more importantly, it is impossible to fully understand the complexities of any project, much less an individual trade or even a specific task. As this second point is part of the underlying theme of your presentation, I figured I’d outline the development of my understanding of the subject before moving onto other parts of my professional development. If you remember our conversation, I was quite skeptical of this point. I was fresh blood at that time used to cramming useless facts and figures into my brain at maximum flow. I understood that there was a special language in the field with numerous techniques and mediums, and I thought that once you got that general grasp of the major trades – Concrete, Steel, Masonry, Finishes, Specialties, etc. – The rest would come naturally. I mean, how tough could it be? There are industry standards and everything. Ignorance is bliss, am I right? Things went pretty much according to plan throughout my time in our main office working estimating and marketing. Everything made sense, everything had an explanation, and everything seemed to be nice and organized. Then I hit the field and realized that everything was perfect because it was all theory. Application is a much different story. Not too far into my first job, I was surprised to run into constructability issues that perplexed even my senior superintendent and senior PM. In some situations our architect had omitted details or previous details were not applicable as new systems had been approved post design. One specific instance involved an approved roofing change (to standing seam metal roofing – cost benefit, go figure). This created an issue as we uncovered we had insufficient details at the interfaces with the roofing system, fascia, soffit, and building system. This was a large issue as this building was to have an above average rating for air barrier and building insulation. The entire time I was in estimating, I was practicing building everything in my head. It was a useful tool I learned in the beginning, and certainly aided in my understanding of various building systems. One problem, however, is that you can only build what you see on the page or in the specs. If you’ve never built it in real life and never seen it, how are you supposed to know you’re missing something? How was I supposed to know whether a double pane window comes as an assembled unit or is assembled on site? Does it need an additional bead of sealant upon installation? The sealant isn’t shown in the details. Precast storm pipe is pretty easy, right? Just pair up the ends and connect it to the manholes. Or, have the manholes pre-cut to receive the pipe and hope everything lines up right. Oh yeah, and make sure to fill and grout the opening to create a water-tight enclosure. That wasn’t in the plans and specs? Which brings me back to the problem at hand. The designer (or rather, the design) doesn’t know everything – and they shouldn’t have to – but sometimes they literally don’t know anything (because they didn’t design it). And that’s where you really run into trouble when you assume you will have to know everything. There are so many options and so many solutions. The standard industry practice when you hit a major problem with no solid direction is to frantically boil a ten gallon pot of information pasta, have everyone grab a handful, and throw it at the walls and ceiling of the office trailer. Whatever sticks the best with the lowest amount of effort at the best cost is usually what we frame and redline into our drawings. Senior management is the best at flinging pasta, but as long as you’ve got something to throw with, you always have the ability to find the best solution. Anyways, to get away from analogy, I was surprised at how freeform and chaotic the process of finding a solution with basically no starting point was. That’s not to say that our final selections weren’t reliable, proven, and up to code, but for example, there’s hundreds of ways to ensure a seal between roof and fascia. Multiply that by the number of field decisions you have to make throughout the lifespan of a project and you’ve got one heck of a ride. Instead of leading a horse, I found myself riding a bull and holding on for dear life. The concept of knowledge management as you outlined in your presentation is certainly an intriguing one – the ability to, in essence, pick out the stickiest noodles from the bunch with little effort so that your starting point is much further along and at a much more civil point in the process of conflict resolution. As a ‘newbie,’ though, the biggest problem that I’ve found is not finding the information I don’t have, it’s finding out what information I don’t have. It may take me days, weeks, or months to research a specific solution, but as long as I know I need it, I know I can get it. If I don’t know I need a specific piece of information for a process I’m preparing for, I won’t know until after I’ve made the mistake of not having it. And while this is a problem experienced more often by the inexperienced, it is something we all encounter on a regular basis. This, in my opinion, is where the current hurdle with knowledge management lies. Cataloguing and databasing information is all fine and dandy, but how do we express an issue we don’t understand to a system or service? How is this system going to fully comprehend all of the potential complexities? How is the information we don’t know we need going to find its way to us? And more importantly to me as a GC, how does this system mitigate risk to the user? I’ve passed this on to a couple of co-workers and am waiting for their response. Let me know if you have any questions, need me to expand, or would like to lead me in a different direction. I am contemplating writing a proposal having to do with knowledge management. I am interested in your experience if you are now on the build side (vs the estimating side). My specific interest is to what extent have you found things to be more complicated than schooling might have indicated? I can elaborate but there is no point unless 1) you are not simply estimating these days and 2) you are willing to write or speak to me on this. If you get to design and build generation after generation of essentially the same structure and you get to study the old problems, then you end up with a mature well-designed product. Over the decades automobiles have clearly become both more reliable and longer-lasting. Not necessarily so with structures, especially when they are not built repetitively, as might be a standardized overpass/bridge over an interstate; but put it in an urban area, jazz it up with architectural features and you may be adding problems. DOT’s have test tracks to learn more about particular pavements. No such luxury applies to anything with even a little bit of novelty. Lest you think the immense challenges of designing for durability apply only to the minor stuff Cary Concrete Products is normally involved with, here are snippets from a recent story. 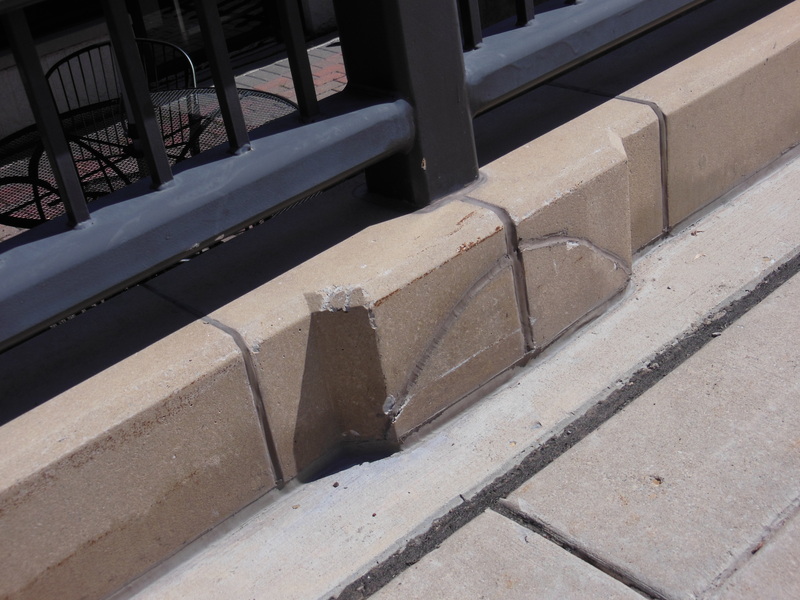 July 27 –Cracks emerged in concrete girders. A drainage hole on the bridge deck plugged up. Rust showed above piers. 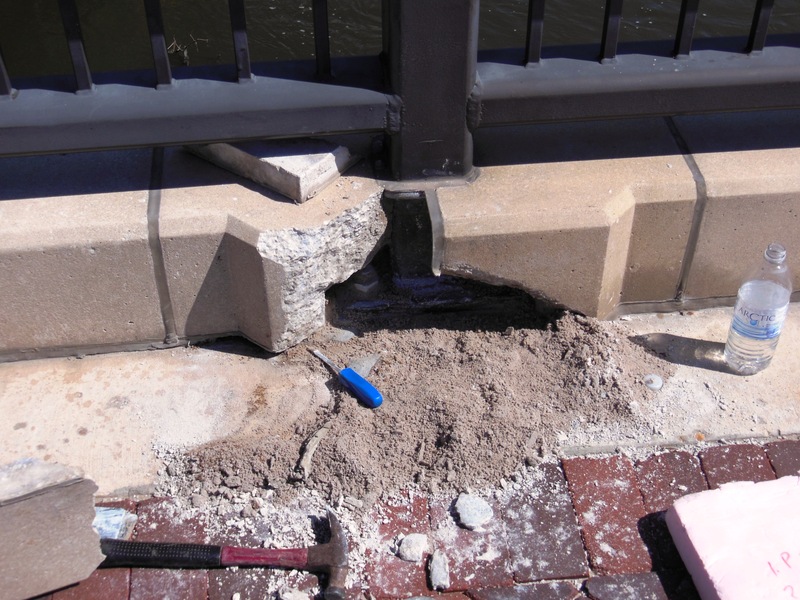 Seven years after the collapse of its predecessor, the new Interstate 35W bridge has been showing its age…Repairs to the system were eventually made under warranty, but not before years of finger-pointing between the state and the lead contractor. Taxpayers also covered some costs. To summarize: enough moisture entered an unusually large mortar-filled void. When frozen it was able to generate enough force to crack concrete. We say that the piece “failed” but in fact the piece performed exactly as it was designed to perform. 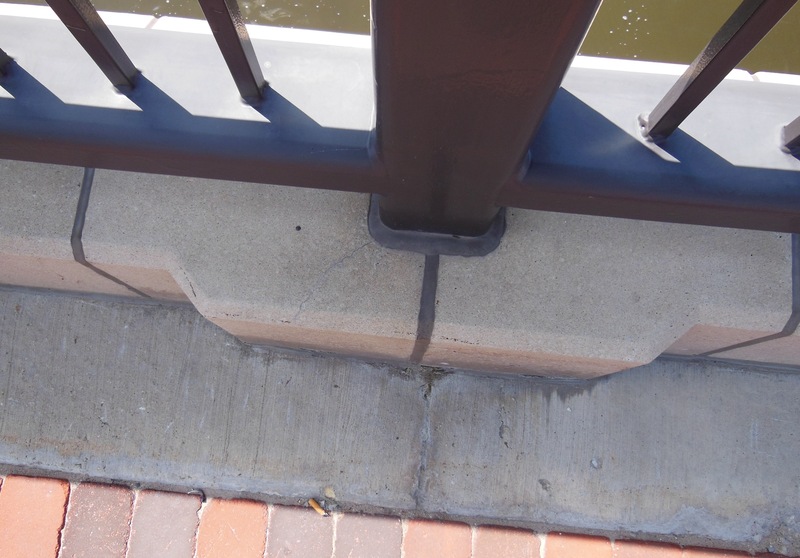 The curbs at the posts in this railing system were not durable because the design did not anticipate what occurred. With hindsight we can easily see what happened. The sidewalk, including the overhang, slopes to the roadway for drainage. 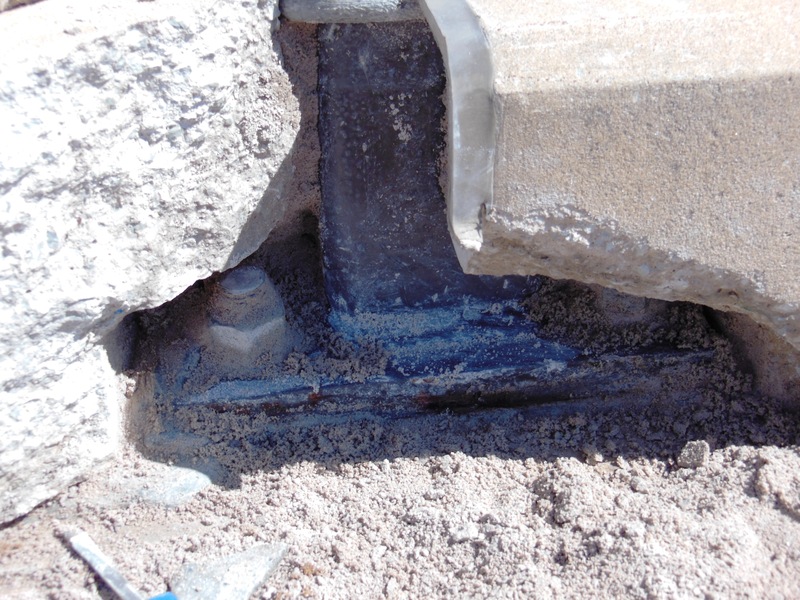 Water flows into the mortar that is the bed joint of the curb pieces. Visible large cracks form and the curb piece falls apart. In 6 years, about 15% of the pieces at this condition have already failed. All other curb pieces, piers, etc., are in excellent condition. This is the railing system. It’s on a roadway bridge. 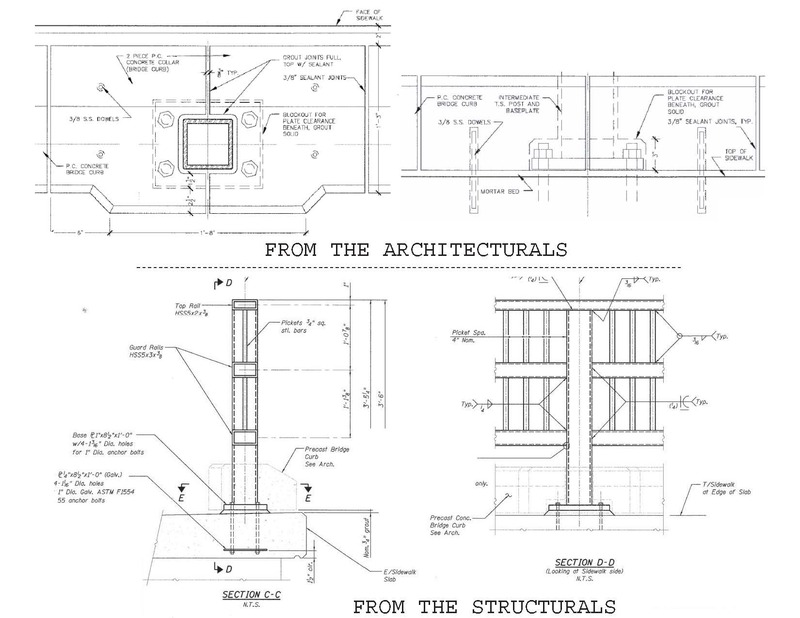 Structural detail from contract drawings. Visible cracking has occurred in this piece. The foresight to anticipate this is highly improbably. For 25+ years I have been regularly involved with mortar-filled openings, and never before saw a failure of this type. Couldyou reasonably expect someone to anticipate this? Failure required both a large volume of mortar and a large volume of water (and a freezing climate). Rules simply about the size of mortar-filled blockouts would not help. (I am sure such rules exist in <0.05% of architectural firms and <0.5% of engineering firms.) Avoiding this failure would require you to have imagined this scenario. It only is an issue at the pieces at the posts. 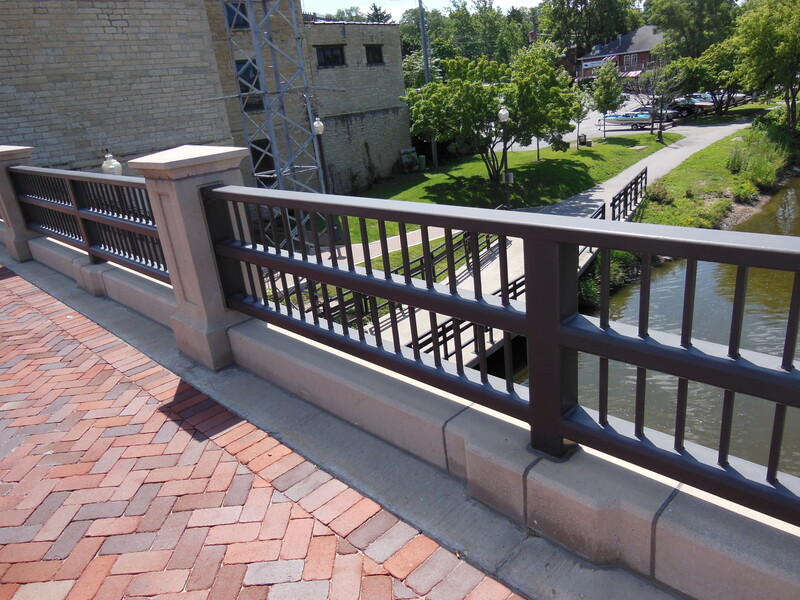 If you were using this exact railing on many bridges you would be in a different business and in 5 years or less you would have learned that this particular detail does not work. And you would never use it again. This can also be a reminder that a BIM with intelligent objects needs both software that can store and apply the knowledge and an organization that can capture and organize little tidbits like what we learned from this minor failure. We are not close to doing that in non-repetitive structures. Today was a lovely spring day and I even got to take a little bike ride. That puts me in a very good mood. So one of those constant screw-ups that occur here on planetcommercialconstruction struck me as funny rather than annoying. Viewing commercial construction as a comedy of errors is not as unreasonable as it might seem. In other industries people build prototypes to discover problems before they build the real thing. Since we build large-scale prototypes (that is what a new building or road or park is) we are constantly finding new possibilities for errors. Because so little is “standard” in this business, even processes tend to be non-standard. Last month I was surprised when a plant submitted samples of two shades of red, got an order for some mockup pieces with the right mix number attached, and somehow, despite apparent good business process, managed to make and crate up 4 full size gray pieces. I did not laugh when that happened, but it wasn’t yet spring. Today’s laugh came in the context of a job that is getting overripe. I sent samples to the GC and they took two weeks to get to the designer. Those were rejected because they had the color and the finish that was specified (rather than what was “intended” – that’s life on planetcommercialconstruction). We have run out of time. So this time I gave the plant a transmittal with the name and address of the designer so samples could go direct and we could get approval and get this into production. This AM I saw an email from Fed Ex saying they had delivered the package. Great! I sent the designer an email so he would know it was in his mail room. So when I showed up at the office and saw that a carton about the size of two 12″ square samples had been delivered to me I was surprised. I looked at the label and saw that the plant (not the same one as switched red and gray) had put the designer’s name on the label, but not his address. I had failed to read and verify everything on the FedEx email; had I done what every sub is contractually obligated to do, which is to read every one of the gazillion pages of paper, email, drawings, etc. that get sent to us in a project and scour them for conflicts, then I would have detected this earlier and avoided the embarrassment of telling a designer the sample had arrived at his office when it was actually at mine. The good news is that I took a short bike ride today and so it’s just part of the comedy of errors of commercial construction. This posting was inspired by a request for a final waiver. Last summer I took on a tiny job – a single beam cover (turned out to be 3 pieces when we were done). The job was a poster child for small aggravating jobs that take way too much time in relation to the revenue. It was one of the inspirations for the posting about designers being squeezed. https://planetcommercialconstruction.wordpress.com/2013/10/08/fads-fashions-and-trends-on-planet-commercial-construction/ There was no hostility in the process, just a lot of back and forth and coordination, all way out of proportion to covering a steel beam at a garage door. We were furnish-only and the erector was quite bureaucratic and would not use their normal lifting hardware because of an inconsequential hole size mismatch on a plate. I was so frustrated that I jumped in and ordered eye bolts without waiting for a change order, just hoping that the GC would pay me for the bolts and the fiddling time. (The problem was not mine but I wanted to wash my hands of it and while I normally hate taking risks on extras, it was very <$100). Late in December I was astonished and surprised to find in my mail box a check for the whole contract, including every change order and NO RETENTION. What a pleasant surprise. And this week’s email asking for a final waiver? It only mentioned the base amount. The contrast between the smooth and rapid payment (at least on my end) and the slow and bumpy process of approvals and coordination was amusing. Ah, the planet of surprises, small and large!